The Crusader Wrestling Team has shown much improvement over the past few seasons and continues to improve. With many wrestlers participating in clubs and outside wrestling programs in the off season, Coach Mayer expects to see a much better team in the coming years. Morris Catholic Wrestling had a number of strong showings, earning some honors along the way. 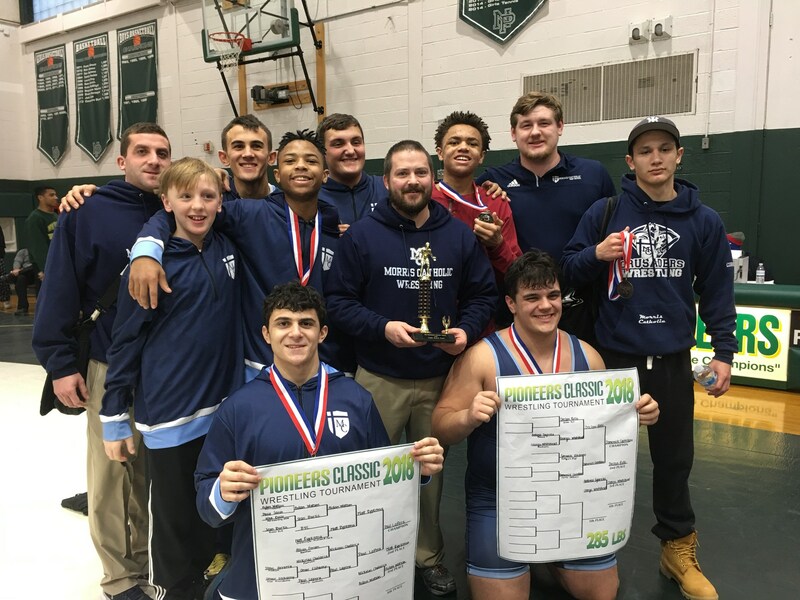 We finished 3rd as a team at the New Providence Pioneer Classic where we had two champions, two 2nd place finishers, one third, and one fourth place finisher. Morris Catholic had its first Morris County finalist in recent history. Two Crusaders placed in districts and qualified for the NJSIAA Regional Tournament. At the conclusion of the season, the NJAC coaches chose the all-conference team, where 7 MC wrestlers earned all-conference honors. During the 2016-2017 season, a number of wrestlers earned NJAC All Conference honors, Sebastian Cornejo and Zack Sieb earned 1st Team, Paul LePera, Kurtis Boyd, and Devonne Swan earned 2nd Team, and Morgan Stevenson earned Honorable Mention. 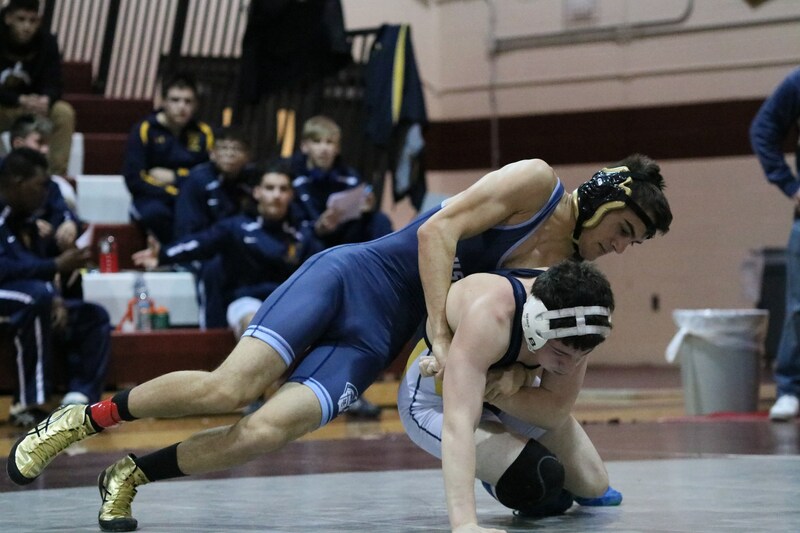 The Crusaders also had their first ever NJSIAA state qualifier, Sebastian Cornejo. The team will look to add to their list of successes during the 2017-2018 season. The MC Wrestling Team a small but fierce group dedicated to turning boys into men. We foster a nurturing environment that also challenges our wrestlers to embrace and overcome the challenges that they'll encounter on and off the mat. We are capable of helping and enabling young athletes to realize their wrestling goals. We participated in multiple service projects this year to include Operation Appreciation at Brighton Cromwell in Randolph where we packed out care packages for US Soldiers fighting abroad, landscape work for the sisters living right here on MC's campus, and a Pin Cancer event where our team raised $1295 for a noble cause. We celebrated our first "Alumni Night" this year with a home win vs Kushner Academy 50-30 where almost 30 former MC wrestlers and coaches came to watch us wrestle and then break bread together afterward with a potluck style Italian dinner in our cafeteria. Wrestling has always been a driving force in Coach Mayer's life. He was hired as Head Wrestling Coach at MC in 2017 with the vision of turning the team into a power in Northern Jersey. The team shares these goals and Coach Mayer believes that off season wrestling will help the team reach their destination quickly. The team has found individual successes under Coach Mayer, who believes that team championships will come. After wrestling through Hackettstown Rec program and Hackettstown High School, Coach Mayer wrestled for Wilkes University where he was a NCAA Division III National Qualifier. Coach Mayer has coached both NCAA and high school levels, at Centenary University and Hackettstown High School respectively. Coach Hunko balances college, work, and coaching to be with the program. He was hired as the Assistant Wrestling Coach in 2017, and has proven to be a huge help with the upper-weights on the team. Coach Hunko was a state qualifier and 100 match winner for Glen Rock High School and went on to continue wrestling at Rhode Island College before suffering a season ending injury.